Picatinny Arsenal ran three shifts of over 18,000 employees to turn out bombs and artillery shells. In addition, research at the facility was responsible for the invention of a delay fuze for skip bombing and special bombs for dams and oil fields. In 2012, during renovations at the Arsenal murals were uncovered in one of the buildings. You can see photos here. The Curtiss-Wright Corporation produced 139,000 aircraft engines (more than any other firm in the U.S.) Shipyards in Camden and Kearney built destroyers, and Bethlehem Steel and Todd Shipyards repaired over 8,000 ships. 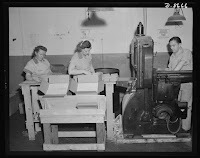 According to one website the number of people employed in New Jersey doubled from 1939 to 1945! 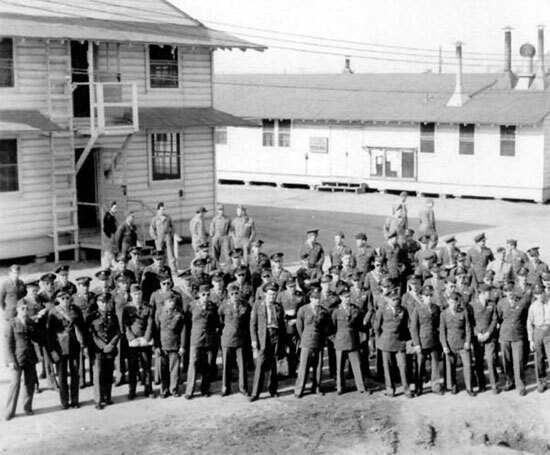 Troop Training Centers: Fort Dix served as a reception and training center for 1.3 million soldiers (at the end of the war, the facility was converted to a separation center). 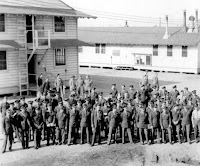 In addition, Fort Monmouth trained over 21,000 members of the Army Signal Corp. Hotels at Atlantic City were used to house Army Air Corps members while they trained on New Jersey beaches. New Jersey was also home to pilot and aircrew training centers at Fort Dix, Millville Army Airfield, Newark Army Airfield, and the Linden Airport. Internment: After the attack at Pearl Harbor, citizens of Japanese descent were rounded up and sent to detention camps, most located in the western and southwestern United States. The Charles Seabrook Company brought thousands of them back. 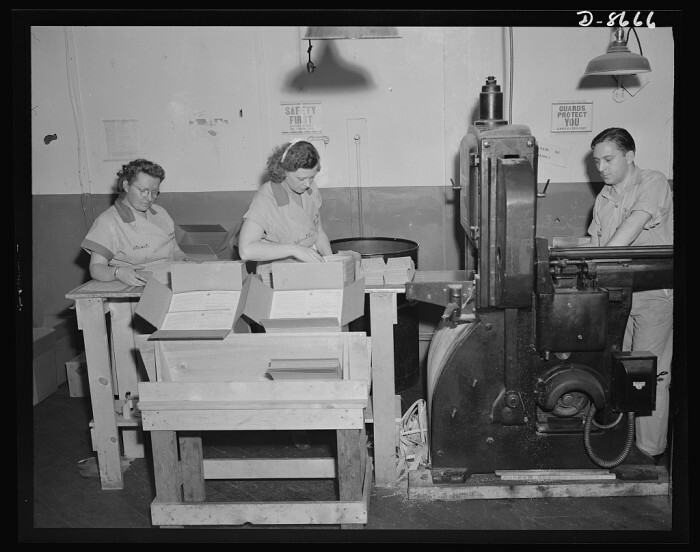 A major supplier of food to the military, the company needed to fill the hundreds of positions vacated by enlisted/drafted soldiers, sailors, and airmen. Initially, about 1,000 internees were relocated to Seabrook from the camps, and by the end of the war nearly 3,000 Japanese Americans worked for fifty-five cents an hour harvesting and dehydrating produce for the food processing division. Many of these families remained in New Jersey after the war. Newark Evening News war correspondent Warren Kennet, referred to as “Newark’s Ernie Pyle.” He was the first journalist ashore at Normandy. William Foley, a rifleman in the 94th Division whose wartime sketches (seen here) led to a post war career as a professional artist. Albert Meserlin was a combat photographer for most of the war, then he became Eisenhower’s personal photographer during the final months which allowed him to witness Germany’s surrender in May 1945. Sergeant Curtis Culin’s idea of attached steel prongs to tanks created the “Rhino Plow” that enable troops to cut through dense Norman hedgerows. And not to be forgotten are the over a half million men and women who served in the armed forces throughout the state, 12,507 of whom lost their lives.